Dubai: Asset quality of GCC banks are expected to face some amount of deterioration in the next 12 to 24 months as loan impairments are likely to go up as a result of less supportive economic environment and the mandatory loan classifications under International Financial Reporting Standards (IFRS) 9.
, Financial Services Research, S&P Global Ratings. What the real estate sector is facing today is a temporary valuation issue. Banks should be proactive in discussing these issues with borrowers. Stress in some of the sectors of the economy combined with the mandatory classification of loan impairments under IFRS 9 reporting standards is a concern among banks. In the UAE, particularly risks associated with real estate valuations are expected result in some loan impairments. With relatively high concentration of loans (about Dh300 billion) to real estate sector in the UAE, that accounts for approximately 20 per cent of total loans and about Dh100 billion worth mortgages, (about 7 per cent of total loans), further decline in real estate prices are expected to have asset quality and credit quality implications. Bankers say, banks should be proactive in addressing issues related to real estate-related exposures. “What the real estate sector is facing today is a temporary valuation issue. Banks should be proactive in discussing these issues with borrowers and possibly extend the loan tenures,” said Abdul Aziz Al Ghurair, CEO of Mashreq and Chairman of UAE Banks Federation. Bankers admit that the upcoming loan classifications under IFRS 9 is likely to increase impairments to some extent. “The challenges with IFRS 9, especially the movement between a normal performing account and what they call stage 2, before it is considered non-performing, there is a big area of accounts that is not performing or not working according to plan. I think that area is causing concerns,” said Vince Cook, CEO of National Bank of Fujairah in a recent interview. Overall, the impact of IFRS 9 was manageable. We expect rated Gulf banks’ asset quality indicators to stabilise in the next 12- 24 months. Cook feels the market as a whole needs to adapt to tighter credit cycles and comply with the rules to avoid a spike in NPLs. In IFRS 9 Stage 2 is where credit risk has increased significantly since initial recognition. When a financial asset transfers to Stage 2, entities are required to recognise lifetime expected credit losses. Stage 3 is where the financial asset is credit impaired. Reclassification of accounts into stage 2 by banks comes with a stigma of potential trouble for the business. The less-supportive economic environment has led to a slight deterioration in the asset quality indicators for rated banks in the region. 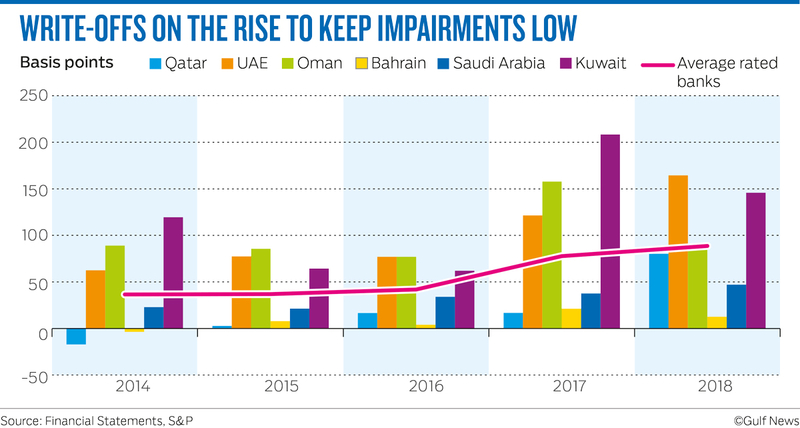 According to S&P, Stage 3 loans comprised 3.1 per cent of their total loans of GCC banks on average at year-end 2018, up from 2.6 per cent at year-end 2017. The deterioration was most marked in Qatar, the UAE, and Saudi Arabia. Qatar’s economy took a hit after the boycott imposed by its neighbours. Combined with the adjustment that followed the drop in commodities prices in 2014, this depressed real estate prices and hurt the hospitality sector. In the UAE, the proportion of non-performing loans (NPLs) rose because economic performance weakened and the small and mid-size enterprise (SME) and real estate sectors came under pressure. Saudi Arabia, meanwhile, suffered a significant outflow of expatriate workers as the contracting sector faltered and consumption dropped. Bahraini and Omani banks saw a smaller increase in NPLs over the past year. Kuwait is the only GCC country where the asset quality indicators for rated banks have improved. However, S&P attribute this to the effect of write-offs, rather than to a genuine improvement in the underlying asset quality. “In the next 12-24 months, we expect GCC banks’ stock of problematic loans (that is, those at either Stage 2 or Stage 3) to remain stable, but that some Stage 2 loans will migrate to Stage 3. If the GCC maintains its slight economic recovery, the pace of migration should slow, compared with that in 2018,” said Damak.